Each Friday throughout the regular season Kevin Weekes will be bringing you his Friday Four in his Weekes on the Web blog. He will be blogging about four players, teams, plays, trends or really four of whatever in the NHL that have caught his eye. We saw this last season at the start of the season too. We are seeing a lot of goals scored that are a direct result of a faceoff win. The reason is more teams now are running plays off the faceoff. One thing Dan Bylsma did when he was the coach of the Pittsburgh Penguins is he implemented a lot of faceoff plays. He spoke to Mike Tomlin, the coach of the Pittsburgh Steelers, about creating plays, player movement, and Bylsma got real creative with how he was doing it by putting players in motion off different faceoff situations. That became a big advantage for Pittsburgh. When you can go Sidney Crosby, Evgeni Malkin and Brandon Sutter down the middle, or Jordan Staal when he was there, that's a formative group of centers who are savvy at winning faceoffs. The Penguins were probably the first team that had all these different faceoff plays and they ran them in all three zones. It worked for them. At the start of this season I'm seeing a high percentage of goals scored that are a direct result of faceoffs because more and more teams are being aggressive in terms of their approach and how they attack off a faceoff. I see them happening every night when I'm in the NHL Network studio. So teams are more aggressive in terms of how they attack, but the attack is aided by the fact teams are trying to adjust to different personnel, especially on defense. For example, the Toronto Maple Leafs blue line is different this season than it was last season. I think it's better, but it's different with new personnel and they are one of several teams trying to adjust to situations and learning how to read situations together. 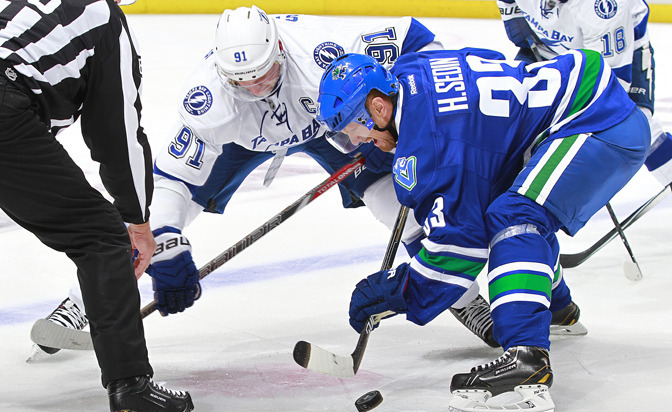 A faceoff is one of the tougher situations to read. With a faceoff you only have a split second to decide. It happens so quickly, so teams can take advantage of some indecision or confusion of teams trying to adjust to new personnel by running plays off the draw. Ottawa Senators coach Paul MacLean told me the biggest area in the Senators game this season has to be faceoffs for that very reason. To win in the NHL you need to take advantage of your backup goalie, use him and get points out of his starts. It will be the difference in making and missing the Stanley Cup Playoffs for some teams. The good teams are doing this, and they're doing it in smart ways. For example, Tampa Bay Lightning goalie Evgeni Nabokov got the start Tuesday night against the Calgary Flames after Ben Bishop started Monday against the Edmonton Oilers. It's a back-to-back, the perfect time to utilize the backup goalie. The Lightning got two points out of Nabokov's start. He was solid. The Boston Bruins have played Niklas Svedberg a couple of times. Ray Emery got in for the Philadelphia Flyers on Wednesday and beat the Penguins after Steve Mason lost to the Chicago Blackhawks on Tuesday. Flyers coach Craig Berube knows Mason hasn't hit his stride yet this season. He knows he's not playing to the same level he played at last season. So he knows he has to get Emery in games early and use him to get him going and get some points on the board. It worked Wednesday. Jaroslav Halak is struggling a bit with the New York Islanders, so Jack Capuano is using Chad Johnson on occasion. The same holds true for Mike Smith with the Arizona Coyotes, and Devan Dubnyk has done a solid job spelling him as Smith tries to find his game. Coaches recognize it's very important to get the backup in early. Teams able to manage that in the right way give themselves a better chance of being in the playoffs. For some teams, if they can get even 20 points from their backup it might be the difference between making the playoffs or not. 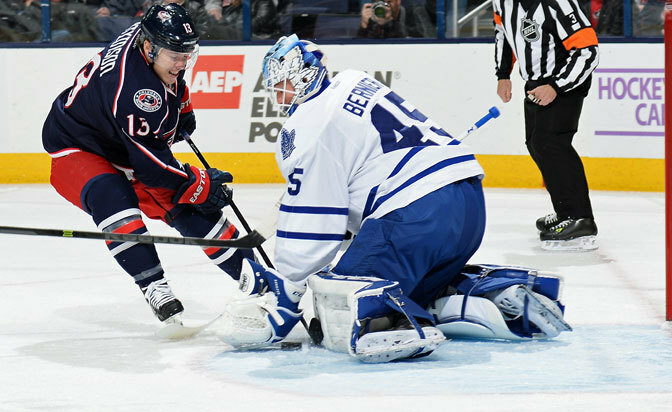 Watch Columbus Blue Jackets forward Cam Atkinson on a nightly basis. Watch Bruins defenseman Torey Krug or Flames forward Johnny Gaudreau, a.k.a Johnny Hockey. Watch Colorado Avalanche defenseman Tyson Barrie. Watch these guys. They can be gamebreakers. Who cares if they're not all that big? This is not about can he play, is he big enough, can he handle the rigors of an 82-game season anymore. This is about these players being gamebreakers. Krug scored a goal Tuesday night that was simple, and simply amazing. He's a left-handed defenseman playing the right side. There was a hard rim around the wall. Krug took it on his backhand, stopped the puck, took two quick strides on his offside, wrister, short side, goal. That play is unbelievable. That's unreal skill. That's unreal strength with his stick, his hands to be able to execute that play. He's a special player. Look at Gaudreau's assist the other night against the Lightning. It was a power play, but he had to dangle his way through on a 1-on-4. At the NHL level. And he created the play to get a goal. Gamebreaker. These guys are unafraid and very seldom do you see them get knocked over. I'll use Minnesota Wild left wing Zach Parise as an example. I played with him in New Jersey. Honestly, I recall one time, maybe, where I saw Zach get knocked off the puck because he got creamed by a guy bigger than him. It's about core strength. These quote-unquote undersized players have incredible core strength and they are gamebreakers in every sense of that word. This isn't about making the turnover or forcing the turnover, this is about seeing a lot of teams counterattacking off the turnover and creating Grade A scoring chances. Look at the goal Nashville Predators forward James Neal scored Tuesday against Arizona. It was directly off a quick counterattack following a neutral zone turnover created by the Predators. Mike Ribeiro made a great pass and Neal did a fantastic job of sliding into space to create an open look for a one-timer, but it was all about the speed of the counterattack. Those neutral zone counters are so important. The Lightning have scored a few goals like this too. More teams now are coming and countering off of a neutral zone turnover. Before, you used to see teams opt to regroup off a neutral zone turnover, pull the puck back behind the red line and try to set up for a clean zone entry. Now teams are counterattacking quickly and it's working. It makes sense. You're playing to the pace, the skill, the ability of your team. I see a lot of it from the Lightning, the Penguins, Montreal Canadiens, Bruins and obviously the Blackhawks, but that one goes without saying. It's not even fair the way the Blackhawks can counterattack. Duncan Keith is oftentimes the first guy leading that counterattack. It's not fair.